Life at GABC — GOLDEN ABC INC. Here at GABC we provide a holistic approach in the development of our people. We encourage expressing individuality aligned with our corporate core values. In GABC, no matter where you work, our people’s style, ideas and passion make life exciting and special everyday. GREAT stands for GOLDEN ABC’s Recognition of Employee’s Achievements and Triumphs. It is an annual program that honors deserving men and women who have worked hard and dedicated their hearts in the work that they do. The 2019 Awardees exemplify GABC’s corporate values to the highest degree. They have demonstrated and lived with the values of Integrity, Professionalism, Service and Spirit of Enterprise, transforming everyday life into the extraordinary, not only for themselves, but for the people around them. To all our 2019 awardees, congratulations and continue to fashion experiences that inspire greatness! Store Leaders across Philippines and Vietnam gathered last march 7 & 8 for the 2019 National Sales Conference. This year’s conference focuses on customer experience and operational excellence guided by six powerful words of GABC Purpose – We Fashion Experiences That Inspire Greatness. Red Logo President & COO Ricky Sy officially opened the conference. Chief Marketing Officer, Ms Alice T. Liu giving a heartfelt message to inspire our leaders. GOLDEN ABC Chairman and CEO Mr. Bernie Liu rallied sales leaders in living & fulfilling the GABC Purpose. The dynamic store leaders worked their way through the various activities. GOLDEN ABC celebrates our 2019 Founders’ Day by remembering our history and giving honor to our legacy. It was a fitting occasion to launch the GABC Company Purpose Statement, inspired by the heritage of our Founders, Dame Norma Liu and the late Knight Leo Lim Liu. As ONE GABC, our heartbeat in everything we do is that WE FASHION EXPERIENCES THAT INSPIRE GREATNESS! For 33 years now, PENSHOPPE has continuously taken the lead in the creation of the Sinulog Arch, a symbolic fixture standing at the heart of Fuente Osmena, Cebu City. It is our way of honoring Senyor Santo Nino and expressing our deepest gratitude for the many blessings we receive each and every day. This year’s design is inspired by the colorful festivities of the Sinulog where the Santo Nino de Cebu is reverently placed at the center of the Arch. He continues to bring hearts closer to God, as He hears the countless petitions of His people, and unceasingly intercedes on behalf of the faithful. The SINULOG commemorates the FEAST OF THE SENYOR SANTO NINO. This year’s theme “ONE BEAT, ONE DANCE FOR THE WORLD” calls out to all the faithful to find the courage to be powerful instruments of change for our nation, and for the world. GOLDEN ABC definitely knows a surefire way to celebrate the HAPPIEST TIME of the year! This year’s epic Christmas grind was a showcase of the finest, ultra creative talents of GABC, pumped up in their OOTDs. Golden ABC joins the Philippine Retailers Association (PRA) and the rest of the retailers in the world in celebrating Retail Employees' Day (RED) today. We honor the dedication and commitment of the 5000 men and women who make up the GOLDEN ABC sales force. Day in and day out, they bring our stores to life and strive to deliver the total brand customer experience the way only GABC can. Our deepest gratitude to our Retail Frontliners. We are #OneGABC. 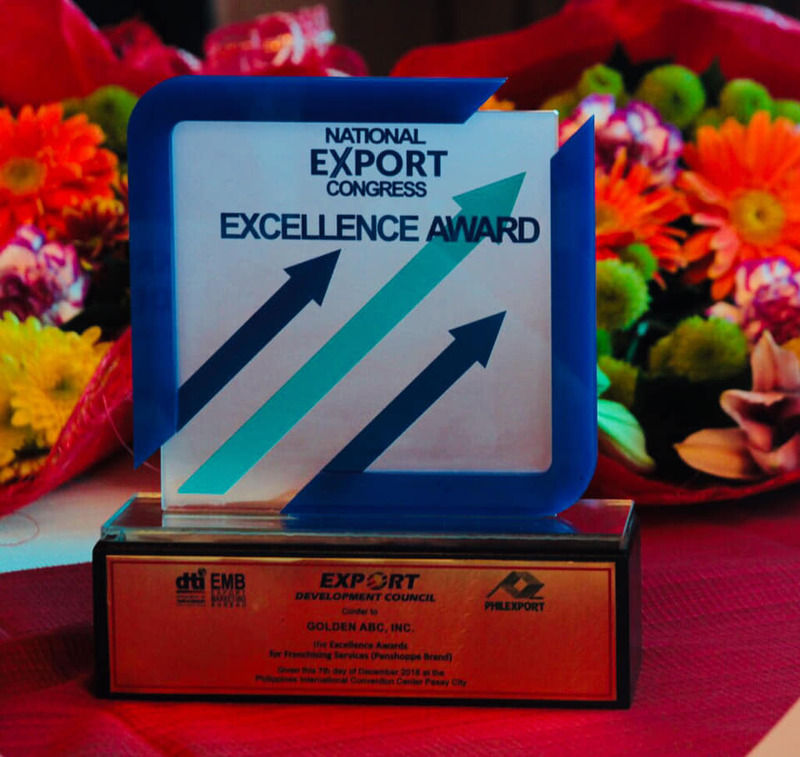 GOLDEN ABC takes home the Excellence Award on Export Services today, during the National Export Congress, at the Philippine International Convention Center. The recognition is conferred to companies who show exemplary contribution to the industry and exhibit excellence in their respective fields. For this year, GOLDEN ABC is the only retail company recipient among the 25 other awardees from various industries. Receiving for GOLDEN ABC are Bryan Liu, E-Commerce and Business Transformation Manager, and Brandon Liu, Merchandise Manager. GOLDEN ABC Board of Directors and the entire Leadership Team warmly welcome our new Board Advisor Mr. Jose Maria Castellano, the former CEO and Deputy Chairman of the Inditex Group, one of the largest fashion groups in the world which owns brands such as Zara, Massimo Dutti and Bershka among others. Travelling for the first time to Manila, his visit signals the beginning of an exciting journey for our own retail brands. Mr. Castellano with members of the Board of Directors led by Chairman and CEO Bernie Liu, joined by Mr. Alfred Go, Mr. Charlie Liu, Mr. Edmun Liu and Independent Director Atty. Vic Noel. First order of the day was to visit the different GOLDEN ABC boutiques around the metro. Mr. Castellano also visited the GABC Corporate Office and met with the Management Committee. GREAT Awards stands for GABC's Recognition of Employees' Achievements and Triumphs. It honors deserving employees who exemplified at heart, the company's core values of Integrity, Professionalism, Entrepreneurship and Service. This year, 35 employees stood out as the 2018 GREAT Awardees. Reaping the fruits of their dedication and enjoying their sweet victory, the awardees kick-start their journey in the vibrant, merry city of Osaka, Japan. Such was the experience of our GABC leaders as they unravelled God's message of inspiration through this Pilgrimage of Purpose in the Holy Land. GABC, let us answer the Lord's call and bring GREATness to the world! Team GABC takes a stand against bullying as they proudly wear pieces from the I Am Different 2.0 Collection. Congratulations to this 2018 season’s Basketball champions, the Red team! Game Time is GABC's Sports Fest under its Road To Wellness program, designed to help promote teamwork, sportsmanship, and camaraderie among employees. Last August 17, 2018, we concluded the best of 3 championship games between the Red and Dark Gray teams. Watch out for more announcements and the upcoming awarding ceremony. GABC employees school us on how to style the different pieces from the #COEDbyOXYGEN Collection. From casual tees to cozy pullovers, there's something for everyone. The GABC Leadership Conference was held last July 5 with the single objective of inspiring and challenging our 200 strong leadership team about unlocking the company's potentials for exponential growth. Golden ABC held its Vendor Partners’ Get-Together last June 14. Featuring speeches from GABC executives, EVP Alice Liu and Chairman & CEO Bernie Liu, they thanked our Vendor Partners for the continuous support they have been giving the company, and elicited excitement and commitment among our guests when they gave a preview of GABC’s future plans. In the spirit of collaboration, our vendors from different industries converged for this one special afternoon. The future looks great at our new Cebu Head Office. We’ve moved to Cebu’s most exclusive business address and modern building Oakridge IT Center 2. The office houses training and meeting rooms designed to cater to the growing business requirements of the region. Last June 18, 2018 we had the blessing attended by executives, employees, and business partners. Golden ABC embarks on a new major construction project designed to support its fast expanding business operations. On June 1, 2018, the company broke ground and held a time capsule laying ceremony for its new and modern Distribution Center Facility that will serve as a major hub for its supply chain activities. Part of GABC's Road To Wellness campaign is promoting teamwork, camaraderie, and sportsmanship through various games and activities. On Wednesday, May 16, we formally opened GameTime 2018 - the company's annual sports fest. The ceremony started with a parade of players of different sports and the ceremonial toss led by Chairman and CEO Mr. Bernie Liu and VP for Human Capital Management Mr. Ted Belza Jr.
GABC embarks on the #RoadToWellness. The GREAT Awards last March 10 was a celebration of excellence, achievements, and triumphs as we recognized our exemplary employees who have helped bring the company to greater heights in 2017. We have gathered our Sales Leaders from all over South East Asia for action-packed sessions to equip them with the knowledge and the drive in leading their teams with a purpose in the age of disruption. We congratulate our 10 and 20 year awardees this 2018, as GOLDEN ABC Celebrates the History of Achievements & Milestones in Professional Service of our dedicated employees in the GABC family. We honor the hard work and passion of our Founder, Dame Norma Liu, to build the dream that is GOLDEN ABC. Last February 6, we celebrated Founder’s Day! It was also Ma’am Norma’s birthday, so we started the day with a thanksgiving mass and celebrated with birthday noodles and ice cream! Leaning on Penshoppe’s household name & iconic logo. A cool inflection of key sportswear silhouettes and vibrant colors. Here's how our employees rocked the Old School Collection. Fun Fact: GABC CEO & Chairman Bernie Liu sketched the iconic Penshoppe logo. With grateful hearts, we proudly proclaim our Cebuano heritage and are one with the people in celebrating the Feast of the Sto. Niño.